A decisive gunshot in October 2012 catapulted Malala Yousafzai to international fame, and two years later to the 2014 Nobel Peace Prize. Malala, a Pashtun girl from Pakistan’s Swat Valley (near the volatile border dividing Pakistan and Afghanistan) was homeward bound from school on that fateful day in October 2012. "Who is Malala?" shouted a Taliban fighter as he jumped onto a school bus. The school girls did not answer. But everyone in the valley knew who Malala was. Fifteen-year-old Malala Yousafzai, had blogged for BBC Urdu, under the pen name Gul Makai, for the right of girls to have an education. 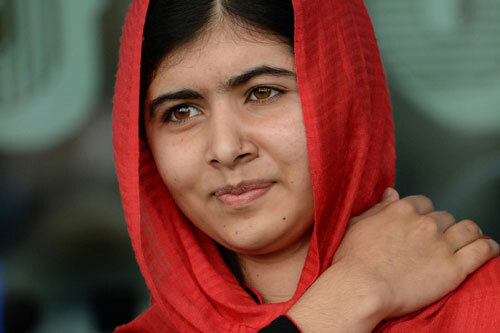 Despite the Taliban infiltration in her hometown, Malala would go to school with her books hidden under her shawl. She continued to study and excel, eventually giving public speeches on behalf of education that her father would help write. She was shot in the head at point-blank range for speaking out about her right to attend school. Two other girls were also seriously injured. Disfigured, Malala was rushed to a hospital in Peshawar, and then flown to Birmingham in UK, where she received specialist treatment at the Queen Elizabeth Hospital. Malala was feted around the globe for her intelligence, conviction, and bravery. She now lives in Birmingham, attends Edgbaston High School there, and she was in a Chemistry class when she received news of the Prize - the youngest-ever recipient, at 17, of the Nobel Peace Prize. "This is not the end. This is really the beginning. I want to see every child going to school," she said. There are thousands more Malalas in the Indian sub-continent who have perhaps suffered a worse fate for standing up for their rights and some have not lived to tell the tale. If not braver, they were just as brave.